Home » Event » Temperament Through Time: a not to be missed (free) event THIS FRIDAY! Temperament Through Time: a not to be missed (free) event THIS FRIDAY! The latest installment in our occasional series of blog posts from friends of HoCoPoLitSo. Today, the acting chair of Howard Community College’s Music Department, Hsien-Ann Meng, encourages all to see Stuart Isacoff this Friday. I would like to invite you to a special event taking place this Friday, February 21, at 2 pm in the Smith Theatre on the campus of Howard Community College. 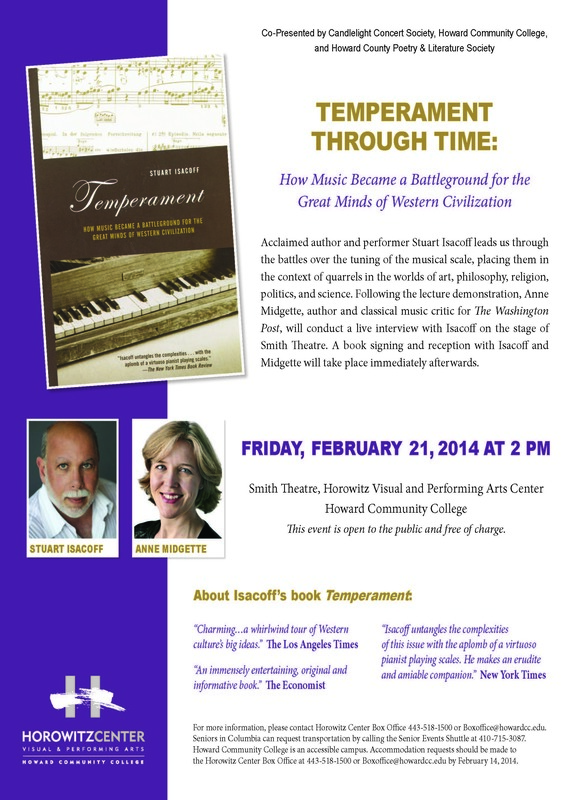 Stuart Isacoff, a wonderful pianist, celebrated writer of music, and the author of Temperament: How Music Became a Battleground for the Great Minds of Western Civilization, will be here to tell the intricate story of how modern musical tuning came about. He will also demonstrate through a reworked Beethoven piano sonata how central the modern tuning system (equal-temperament) is for us to enjoy the master piano works of the 18th and 19th centuries. However, the road to equal-temperament was not a simple one. Isacoff has woven together a beautiful narrative that traces the development of the tuning system in the context of teachings and beliefs of the church, parallel developments in art and science, and the political plays between different power groups throughout history. Whether you are a music lover or a lover of arts and science, there will be lots to take away from this event. This event is free and open to the public. After the lecture demonstration, Anne Midgette, the classical music critic for The Washington Post will join Stuart Isacoff on stage to conduct a Q&A session. A book signing and reception will take place in the Rouse Art Gallery and Horowitz Center Lobby following the Q&A. This event is co-presented by Candlelight Concert Society, Howard Community College Concert Series, and Howard County Poetry & Literature Society. By hocopolitso in Event, Guest post on February 19, 2014 .